This episode, all four hosts are back together to delve back into scenario analysis with a classic, The Edge of Darkness! This episode was recorded on January 3, 2019. It was a record-breaking 58 entries in this year’s contest. Also from SHP, artist Galen Pejeau has sent along a revised, color version of the cover for the Keeper’s Guide to Lovecraft Country Scenarios. It’s now in the layout phase. The initial PDF release will be just scenarios from Chaosium books, then it will expand to include licensees, magazines, MULA monographs, Miskatonic Repository works, and oddities as possible. Check the link in the show notes. Golden Goblin Press last month unleashed a “Free but Vicious Nemean Lion” to celebrate the holiday season. It’s a creature from the Cthulhu Invictus setting. The link to download the PDF is in the blah dee blah. Agent Dinos takes us to the Keystone State with a look at something what lurks below. 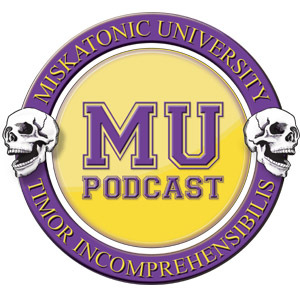 Please remember that if you have any interest in producing a segment for the podcast, please contact mup.feedback@gmail.com. Chris Fisher: Word of general support for Chad: I also don’t pay enough attention to the MPAA screens to talk that lingo. Also, the fish pedicure vector topic was really interesting to me, and between the gaming potential and the general “Icky! How neat!” factor, I wish it hadn’t gotten squashed. From the MU Forums, trevlix: (summarized) If you look at my posting history on any CoC site, you’ll see that Crack’d & Crook’d Manse is my #1 scenario of all time. There are so many great things about it, and I’ve probably run it 15-20 times in my gaming career. I’ve even previously posted some tips here on running it. Needless to say, this was a great episode for me. Also, as in the episode, here be spoilers. One thing that wasn’t mentioned is that Crack’d & Crook’d Manse was originally written as a tournament scenario for Phantastacon 1984 and then published in the Multiverse magazine (issue 3)*. To me, this means this scenario was originally meant to be played as a one-shot at a con. I bring this up because I think thats where some of its quirks come from. The goal of the scenario was to run it for a bunch of people within a short time period and make it enjoyable. To that extent, I think it succeeds. In a con scenario – especially a tournament one – the players are more likely to go to the house even though in different circumstances they may not (e.g. they were in a long campaign). My own experience mirrors this. The majority of the times I’ve run this have been at cons, and even with people new to Call of Cthulhu, and it has always succeeded in that respect. IMO, the brilliance of this scenario is not that its a mythos take on a haunted house, but in how the creature works within the house. Since it moves within the walls of the house, it has agency to avoid the PCs for as long as you want it to. If its early in the scenario and the PCs really want to explore the basement, the creature can move upstairs (with the house moaning and creaking as it does). If its later in the game and the PCs are nowhere near solving it, have it appear and all hell break loose….Also, loved that you guys did this. Please analyze more scenarios like you did here in the future! We talk at length about the Edge of Darkness scenario by Keith Herber, which is now part of the Call of Cthulhu Starter Set.